Read this article if you are ready to move from an Exchange hybrid deployment to a full cloud implementation. One of the more attractive options for getting a company to Exchange Online is to use the hybrid deployment approach described in Exchange Hybrid Deployment and Migration with Office 365. This is the only option that allows you to easily on-board and off-board mailboxes (all other native options are on-board only). In addition to the ability to off-board, a hybrid configuration has the following key options. This topic will help you understand the options for decommissioning Exchange hybrid, and when each of those options should be implemented. There are many variances in when and how to decommission Exchange hybrid servers. Taking the time to understand the implications and properly plan the full or partial decommissioning of on-premises servers is important. Cross-premises availability. This allows you to see a user's free/busy information while scheduling a meeting, regardless of their mailbox premises. Cross-premises archive. This allows a customer to move only a user's archive mailbox to the cloud. This is often the first step for customers to try Office 365, and, more specifically, Exchange Online. Cross-premises discovery searches. This allows a customer to perform an e-discovery search that will crawl mailboxes and archives in both premises (this requires you to configure OAuth authentication). Outlook Web App URL redirection. This allows for users to be redirected to the proper premises for Outlook Web App access. No profile recreation after move. Unlike other migration options, the mailbox GUID doesn't change. This means that you do not have to recreate your profile or re-download the OST after a mailbox move. Depending on your organization's needs, a hybrid deployment is the best option for providing the most seamless user and coexistence experience. A hybrid deployment is not for everyone; in fact there are usually better options. Many of the tenants that have chosen to deploy a hybrid configuration are under fifty seats. While the list of advantages of a hybrid deployment may sound attractive, it comes with a hefty price with regards to complexity. Some of the smaller tenants require the features of a hybrid deployment, but, for most tenants, it would be a much better experience to use either a cutover, staged, or IMAP migration option. There is a program called FastTrack you can use when deciding on the migration approach to take. Information on FastTrack is described on the Office 365 FastTrack page. Do you want to manage user accounts in your on-premises organization? *Some organizations with fewer than 2,000 mailboxes may benefit from features and capabilities that are only available with a hybrid deployment. It's important to carefully consider the benefits of a hybrid deployment with the complexity that introduces. We strongly recommend that customers with fewer than 2,000 mailboxes consider cutover or staged migration before proceeding with a hybrid deployment. When directory synchronization is enabled for a tenant and a user is synchronized from on-premises, most of the attributes cannot be managed from Exchange Online and must be managed from on-premises. This is not due to the hybrid configuration, but it occurs because of directory synchronization. In addition, even if you have directory synchronization in place without running the Hybrid Configuration Wizard, you still cannot manage most of the recipient tasks from the cloud. For more information, see this TechNet blog. Can third-party management tools be used? The question of whether a third-party management tool or ADSIEDIT can be used is often asked. The answer is you can use them, but they are not supported. The Exchange Management Console, the Exchange Administration Center (EAC), and the Exchange Management Shell are the only supported tools that are available to manage Exchange recipients and objects. If you decide to use third-party management tools, it would be at your own risk. Third-party management tools often work fine, but Microsoft does not validate these tools. It is not simple to move from a hybrid configuration to the cloud. The process for getting into a hybrid configuration is one that we have taken a lot of time to get right. While there are issues, we feel we have done a pretty good job of making the almost impossible task of going hybrid a fairly easy wizard-based process. However, we have put little effort into how to get you from a hybrid configuration to the cloud only. Depending on your immediate goals, this process can be fairly simple with some guidance. The following are three common hybrid scenarios along with our recommendation for how to properly achieve the end goal of the customer. Since the hybrid customer base is very diverse, trying to fit all of them into "common" scenarios is difficult. We attempted to provide some high-level scenarios for on-premises Exchange Server decommissioning below, so as you read through these scenarios and form a plan to decommission, you will need to determine the scenario that best fits your needs. Issue: My organization has been running in a hybrid configuration and I have all of my mailboxes in Exchange Online. I do not need to manage my users from on-premises and no longer have a need for directory synchronization or password synchronization. Solution: Since all of the users will be managed in Office 365, and there are no additional directory synchronization requirements, you can safely disable directory synchronization and remove Exchange from the on-premises environment. Run Get-OrganizationConfig | Format-List PublicFoldersEnabled and ensure that it is not set to Remote. If it is set to Remote, and the public folders are something you want to continue to access, you would need to migrate them to Exchange Online. For more information, see Use batch migration to migrate legacy public folders to Office 365 and Exchange Online. Assuming that you have already moved all of the mailboxes to Exchange Online, you can point the MX and Autodiscover DNS records to Exchange Online, instead of to on-premises. For more information, see Reference: External Domain Name System records for Office 365. Make sure to update both the internal and external DNS, or you may have inconsistent client connectivity behavior. If you have Exchange 2007 servers in the environment, you will have to run a similar command on your Exchange 2007 servers to null out the settings. Log in to the Office 365 Admin portal and sign in as the Tenant Administrator. Select the option to manage Exchange. Navigate to Mail Flow -> Connection. You can now disable or delete the inbound and outbound connectors. The HCW creates connectors with unique namespace inbound from <unique identifier> and outbound from <unique identifier> as shown in the graphic below. Under Organization Sharing, remove the organization named O365 to On-Premises - <unique identifier> as shown in the graphic below. If OAuth is configured for an Exchange hybrid deployment, you will want to disable the configuration from both on-premises and Office 365. In most environments, these steps can be skipped because only a small subset of our customers have OAuth configured. From an Exchange 2013 server, open the Exchange Management Shell. Connect Windows PowerShell to Exchange Online. Note: The Identity parameter assumes that you used the Hybrid Configuration Wizard to configure OAuth. If this is not the case, you may need to adjust the value you specified for the identity of the connectors. Disable directory synchronization for your tenants. When this step is completed, all user management tasks will be done from the Office 365 management tools. This means you will no longer use the Exchange Management Console or Exchange Administration Center (EAC). For more information on how to disable directory synchronization, see Deactivate directory synchronization. You can now safely uninstall Exchange from the on-premises servers. Issue: My organization has been running in a hybrid configuration for about a year now and have finally moved my last mailbox to the cloud. I plan to keep Active Directory Federation Services (AD FS) for user authentication of my Exchange Online mailboxes. (This scenario would apply to any customer that is planning on keeping directory synchronization). Solution: Since the customer is planning on keeping AD FS, they will also have to keep directory synchronization since it is a prerequisite. Because of that, they cannot fully remove the Exchange servers from the on-premises environment. However, they can decommission most of the Exchange servers, but leave a couple of servers behind for user management. Keep in mind that the servers that are left running can be run on virtual machines since the workload is almost completely shifted to Exchange Online. Run Get-OrganizationConfig |fl PublicFoldersEnabled and ensure that it is not set to remote. If it is set to remote and you want to continue to access the public folders, you would need to migrate them to Exchange Online. For information on how to do this, see Use batch migration to migrate legacy public folders to Office 365 and Exchange Online. If migrating public folders to Exchange Online is not an option, and you still need them for your users, you should not move forward. Make sure to update both the internal and external DNS, or you may have inconsistent client connectivity and mail flow behaviors. Remove all Exchange servers with the exception of the servers you will retain for user management and creation. Two servers should be sufficient for user management, although you could possibly get by with one server. In addition, there is no need to have a Database Availability Group or any other high availability options. Open the Exchange Management Shell from an Exchange 2013 server. 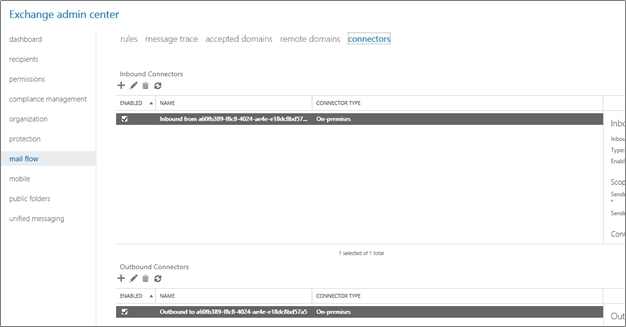 Navigate to Mail Flow -> Connectors. Issue: I want to remove my Exchange servers on-premises after moving all of my mailboxes to Exchange Online. However, we discovered that they are using Exchange for other purposes, such as for a Simple Mail Transfer Protocol (SMTP) relay for an application or for access to public folders. If you have a need for Exchange servers on-premises to meet the current needs of your organization, it may not be in your best interest to remove the on-premises servers. Solution: We recommend against removing Exchange and the hybrid configuration at this point. If you were to even start the process by pointing the Autodiscover Records to Exchange Online, you would immediately break some features like hybrid public folder access. You could change the MX record to point to Exchange Online Protection if it is not already, you could even remove some of the on-premises Exchange servers. However, you would need to keep enough in place to handle the remaining hybrid functions. Usually, this would lead to a very small on-premises footprint.